Contains photosynthetic backteria & heterotrophic backteria which help clarify cloudy water by promoting flocculation. 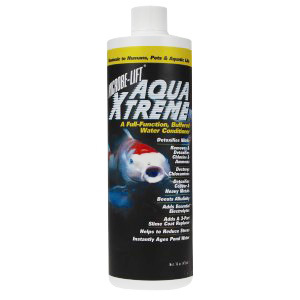 Improves dissolved oxygen levels. Digests organic sludge. 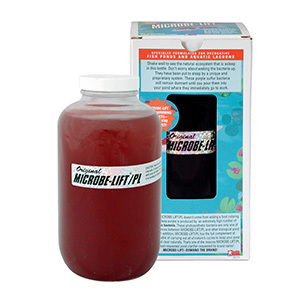 Reduces unpleasant odors (this liquid bacteria is very pungent during application.) For best results, you should maintain a balanced pH. 501-1000 14 oz. 5 oz. 5 oz. 1001-1500 18 oz. 6 oz. 6 oz. Price: $27 Learn about FREE Shipping. Details. 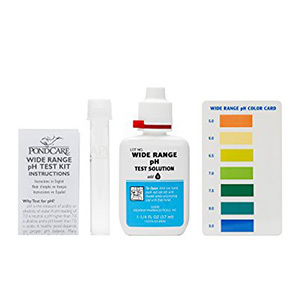 Quickly and accurately evaluates water quality, allowing for detection of minor pH changes and the avoidance of major problems. pH levels are affected by fish waste, rainwater runoff, organic waste, the mineral content of tap water, and a drop in oxygen levels. pH is one of the most important things to monitor in a koi pond. pH is on a scale from 1-14 with 7 being neutral, below 7 means acidic and above a 7 means alkaline. A counterbalance should be added to neutralize the pH level. Baking soda can be used to safely raise the pH, if needed. Price: $10 Learn about FREE Shipping. Details. A safe way to lower pH. Includes electrolytes to help maintain osmotic balance. Also includes a slime coat ingredient for skin protection and stress reduction in pond fish. Use product if pH is above 8.0. Treats 19,200 gallons. Directions for use: Add 1 oz. per 600 gal. of pond water for every 0.1 pH unit decrease desired. 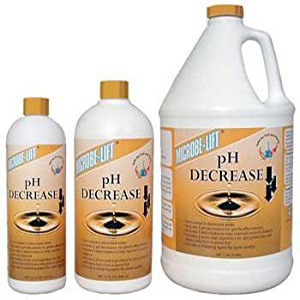 Apply pH decreaser in several steps and measure pH before each addition. Repeat if necessary. Price: $20 Learn about FREE Shipping. Details. Eliminates string algae on contact. Works great on waterfalls, streams, and perimeter rocks. This is a granular algaecide that is water activated. Recommended to turn off your pump for 30 minutes during application. Safe for fish and other plants, not safe for snails and other crustations. Treats approximately 3,000 gallons. Price: $30 Learn about FREE Shipping. Details. Eliminates string algae on contact. Works great on waterfalls, streams, and perimeter rocks. This is a granular algaecide that is water activated. Recommended to turn off your pump for 30 minutes during application. Safe for fish and other plants, not safe for snails and other crustations. Treats approximately 10,000 gallons. Price: $70 Learn about FREE Shipping. Details. For small to medium ponds with heavy algae growth, clean the excess algae off the sides. This will reduce the decaying organic matter. Before using, make certain that the pond has vigorous aeration, ie., a fountain, waterfall, or air pump to avoid fish loss due to low oxygen levels. 24 hour aeration is required. 16 oz. bottle treats 5600 gallons for one application. 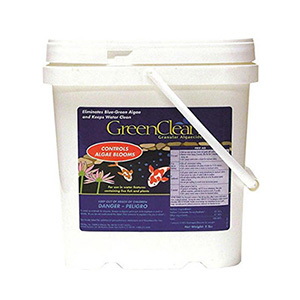 It is recommended for ponds around 500-2000 gallons. Only dose pond once a week, more frequent doses will reduce oxygen levels to unsafe levels for fish. Better to use on cooler days when the sun is not out. Price: $16 Learn about FREE Shipping. Details. 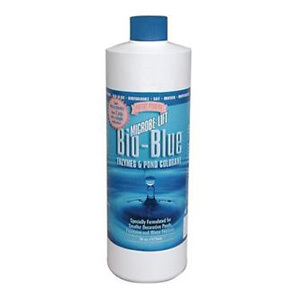 Adds beautiful, aqua-blue color to fountains, aquariums, and ornamental ponds. Use 1 oz. per 1000 gallons. If used for algae control, pond must be deeper than 2 feet to be effective. Price: $22 Learn about FREE Shipping. Details. 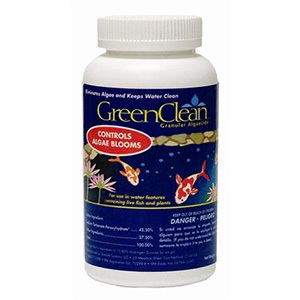 Removes Chlorine & Chloramine which can harm fish. Provides essential slime coat to protect gills. Detoxifies & sequesters heavy metals. Reduces long-term nitrate build-up when used as directed. Important to use whenever doing a big water change or whenever transporting fish, as this is considered a stress reducer.